This FREE offer is only available today, 9/13. Everyone needs inspiration to lead lives that honor God. When our faith is weak or the pressures of the world seem overwhelming, remembering the great men and women of the past can inspire us to renewed strength and purpose. Our spiritual struggles are not new, and the stories of those who have gone before can help lead the way to our own victories. 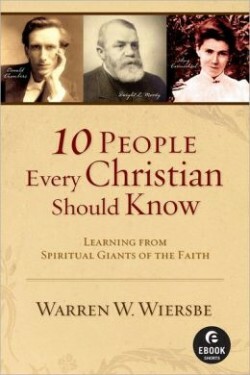 10 People Every Christian Should Know gives you a glimpse into the lives of fascinating and faithful believers whose struggles and triumphs will inspire and encourage you along life’s uncertain journey. This work contains chapters on Matthew Henry, Jonathan Edwards, John Henry Newman, J.B. Lightfoot, Hudson Taylor, Charles Spurgeon, Dwight Moody, Amy Carmichael, Oswald Chambers, and A.W. Tozer. Read about the lives of these influential Christians and be motivated to greater trust in God!